Our 113th Annual Chamber Gala was another exciting event for our members and community. Our Master of Ceremonies, J.J. Jauregui, gave us a walk down memory lane with a little history of our Mayors starting with our first Mayor, Louis Lake, and ending with our current Mayor, Steve Jones. We also had an Elvis impersonator on hand and some fun with Las Vegas style game tables. Our April Business Breakfast was a success. We had David Harris from SCORE Orange County Out Reach talk about how to create and deliver a winning elevator pitch. He deliver his networking process plan on how to create your pitch. Its not just about delivering but also about following up with your connections. Our March Chamber Mixer was hosted by Embassy Suites by Hilton Anaheim South. We had such a great time. Thank you everyone who attended and congratulations to all the raffle prize winners. We look forward to seeing everyone at our next mixer. The Chamber partnered up yesterday with Executive Coaches of Orange County to bring our Nonprofit organizations a great seminar. Board development, branding, Linkedin, and Coaching were among the topics we covered. Thank you all for attending! We hope you got as much valuable information out of it as we did. 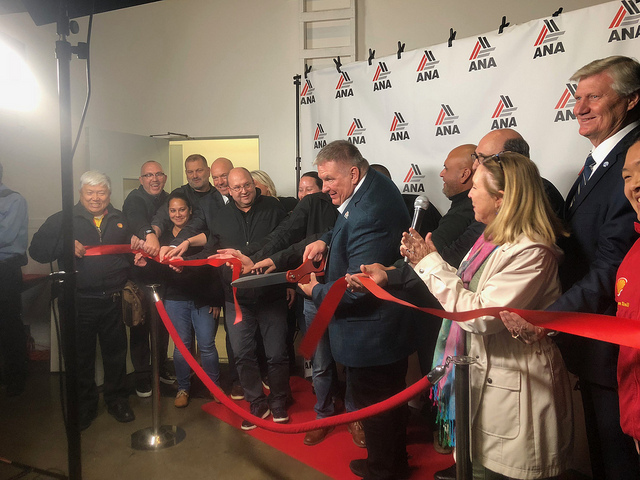 We had the pleasure of welcoming ANA Corporation to Garden Grove with a Ribbon Cutting Ceremony. They introduced the new Grid to Go, which they are exclusive North American Distributors. They also distribute Ammann Compactors and Airman Air Compressors. 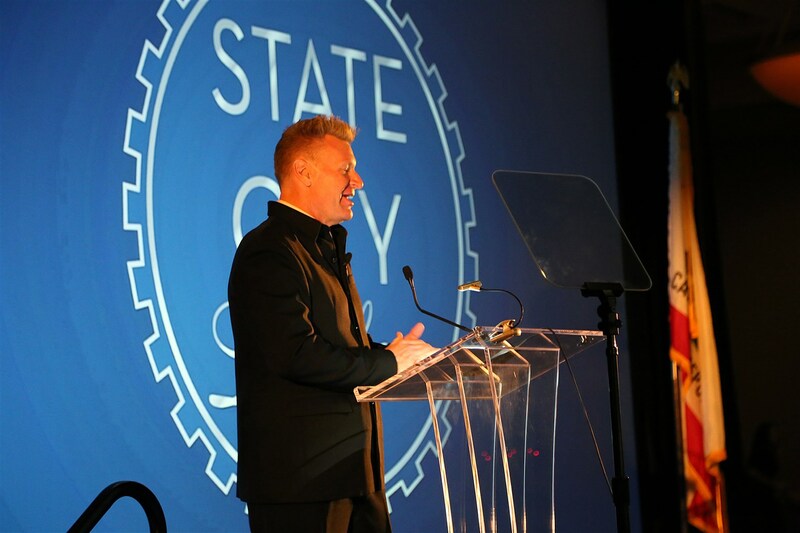 Our State of the City Luncheon was a total success this year with about 500 attendees. Thank you Mayor Steve Jones for all the information of what great things happening here in Garden Grove! 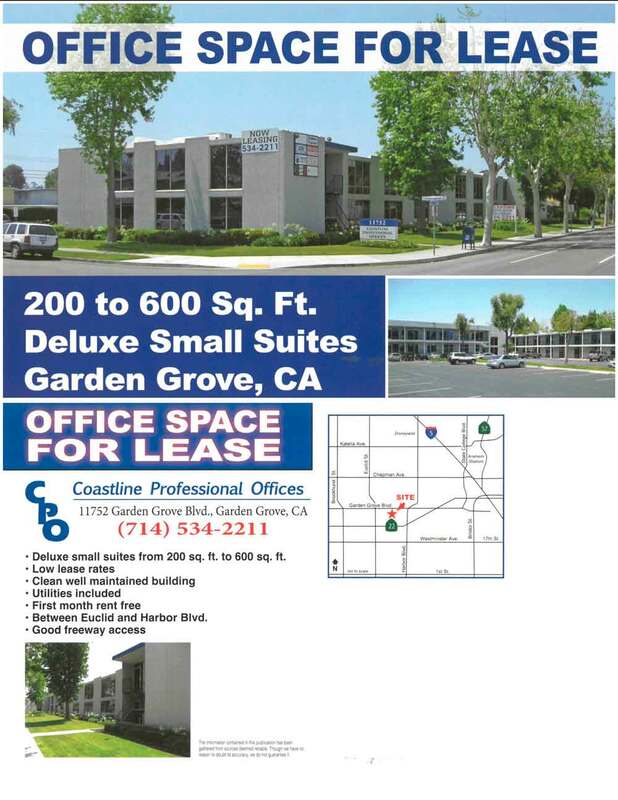 We are excited for Garden Grove's future plans. We would also like to thank all of our Event and Tables Sponsors. Gold's Gym hosted our January Mixer.They gave us a tour of their facility and a great discount for all Chamber Members. Great way to start off the year with motivation. December's Business Breakfast was all about taking care of our loved Seniors. Kelly from Visiting Angels gave a great presentation on how to help our loved ones. She even brought crafts for us to do for the seniors. This years Holiday Mixer was at The Great Wolf of Southern California. Chef Hany put out an excellent food presention from a poke station to a s'mores bar station to a mexican hot chocolate section. Santa Claus even made a quick stop to say hello to everyone. Thank you all for attending this fun event. Looking forward to seeing everyone next year. Chief Building Official, David Dent, & Code Enforcement Supervisor, Pete Roque, gave an informative presentation on "Code Enforcement 101." They talked about the process and resources available to the Garden Grove business community along with business permits. We would like to thank Cypress College for their hospitality. The Garden Grove Board of Directors and staff truly enjoyed the experience that the culinary arts students gave us. Talented students put together an amazing 3 course lunch for us. Cypress Bistro is opened Thursdays for lunch. November's Chamber Mixer, Edible Arrangements- 11-14-18! 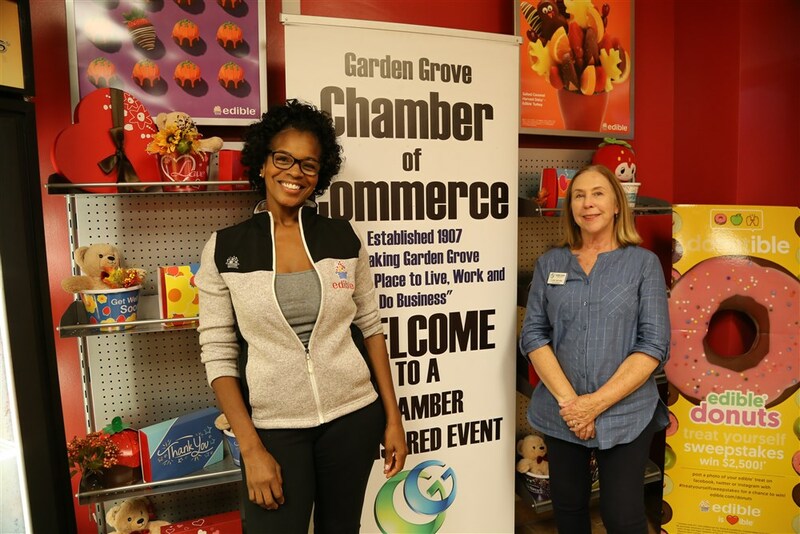 Edible Arrangements hosted November's Chamber Mixer at their location. They had great fruit and snacks for everyone. They also had a mobile game lounge for the kids at heart. Thank you to all who attended and don't forget to support our chamber member Edible Arrangements. 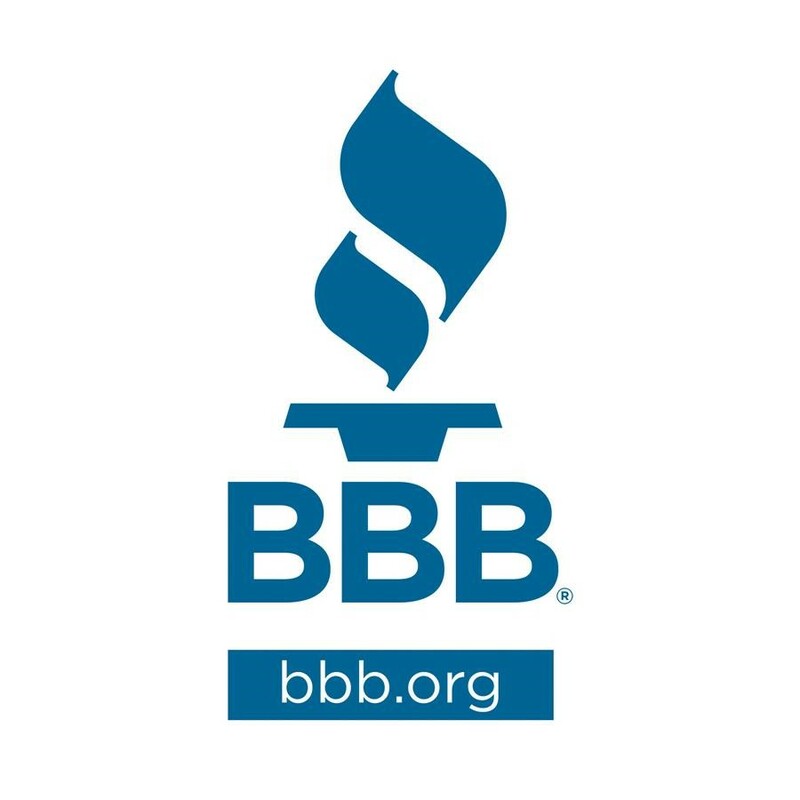 Business to Business Breakfast Meeting- 11-08-18! We had the opportunity to hear from three of our Chamber Members this morning. Clay Bock from Integrity Jewelers, Rhema Corrales from SERVPRO of Westminster, and Norman Kerechuk from GK Design who each gave an interesting presentation about what their business can offer us. Thank you to all who attended. If you have not attended one of our Business Breakfast, you are missing out. 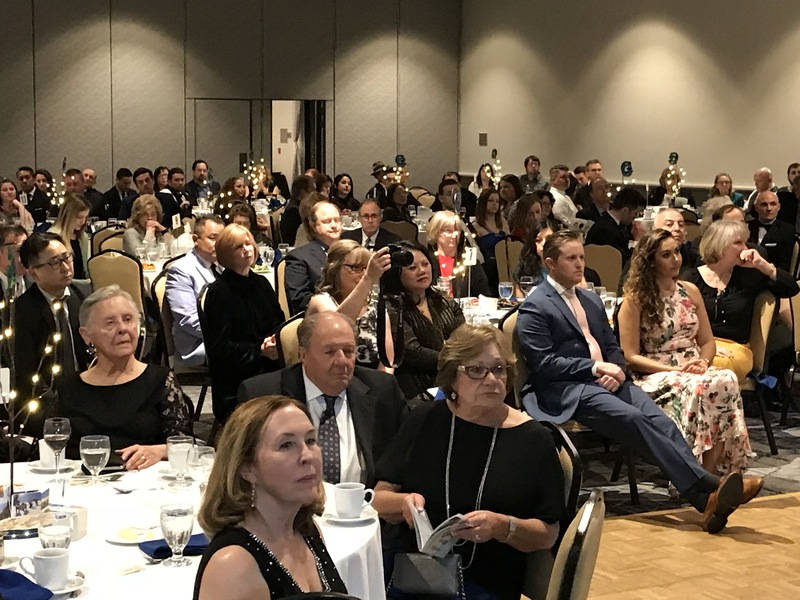 KUMON's Student Award Ceremony & Anniversary Event - 10-25-18! We would like to congratulate Kumon Math & Reading Center of Garden Grove with their 1 Year Anniversary Celebration last night. Also, congratulations go out to the children who received awards. Monthly Chamber Breakfast - 10-25-18! We want to thank everyone who came out to this months Chamber Breakfast. Thank you Dr. True McMahan! Fire Station No. 6 Ribbon Cutting Ceremony! Ribbon cutting ceremony for Fire Station No. 6 was held Tuesday, 10-23-18!. Fire Station No. 6, opened up their doors to celebrate their grand ribbon cutting. A themed kids play area and community room was also part of this project. Monthly Chamber Mixer at Dimond & Shannon Mortuary 10-17-18! Dimond & Shannon Mortuary hosted our October Mixer. Thank you to everyone who came and showed their support for this Chamber Member! Rain didn't stop the crowds from celebration Gold's Gym 1st Year Celebration/Ribbon cutting ceremony! We had a great turnout for support for Chamber member Southland/Envise at their Open House/Ribbon cutting ceremony! Our members showed their support to Team AmVets at their Mixer last event. Team AmVets helps our homeless vets get into apartments that are furnished with nice donated furniture and help them work on job skills. 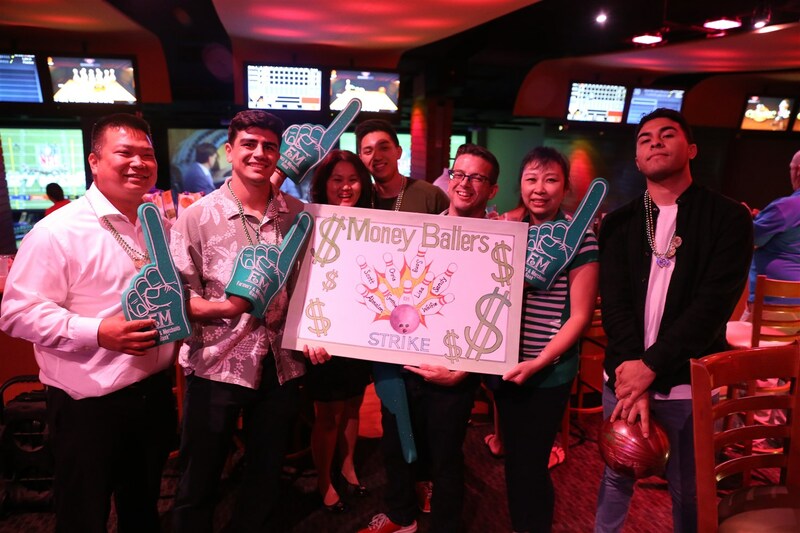 What a fun time everyone had at our Bowling Tournament this year. Our venue changed this year to Bowlmor Anaheim. 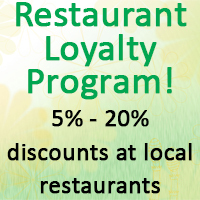 The staff was great and the food was excellent!!! 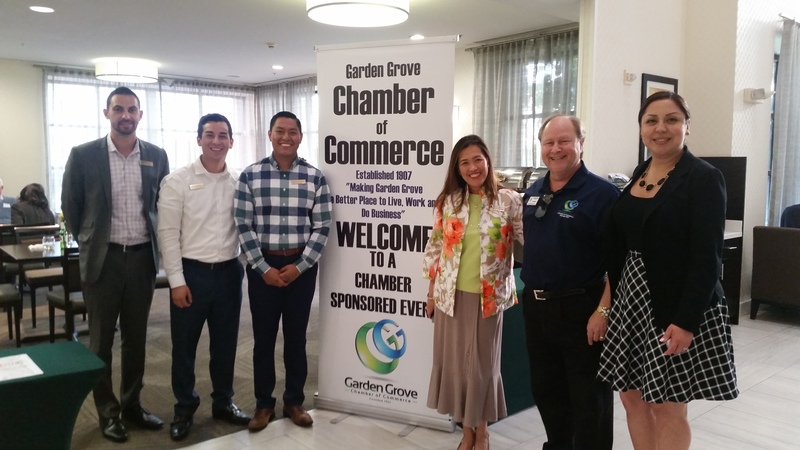 We joined the Garden Grove Tourism and Promotion Corporation and the City of Garden Grove for a special presentation and reception at the Marriott Suites. $25,000.00 sponsorships were presented to the following non-profit organizations; Orange County Food Bank, Boys & Girls Club of Garden Grove, Garden Grove Community Foundation, and H.O.P.E. We were invited to participate in the Filipino Chamber's 10th Annual Green & Health Expo at the Great Wolf Lodge. 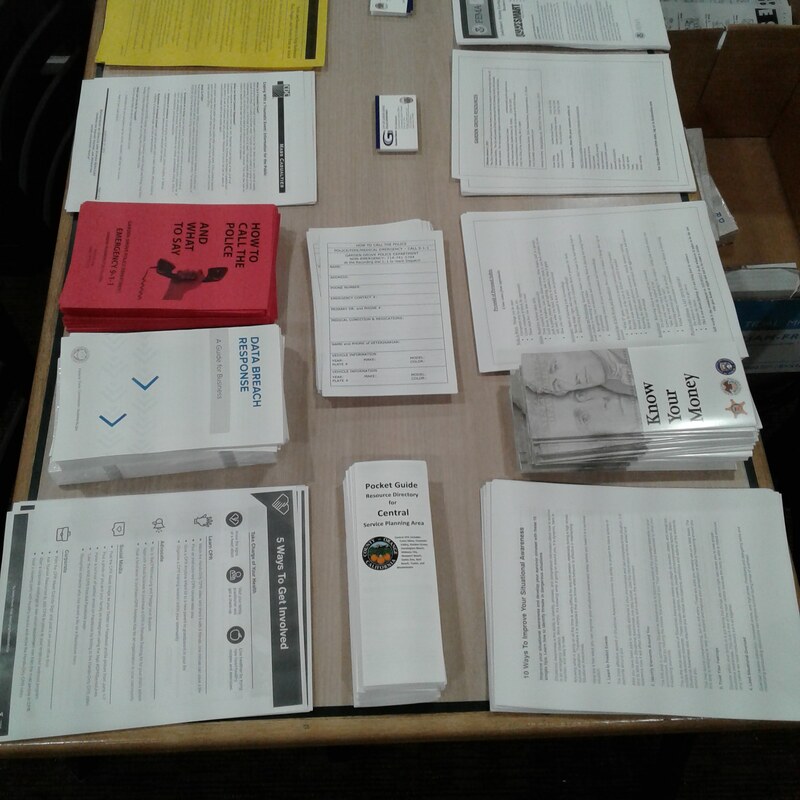 They had a good turn out and we learned a lot of interesting information from the vendors who participated in the event on health and keeping a clean environment! 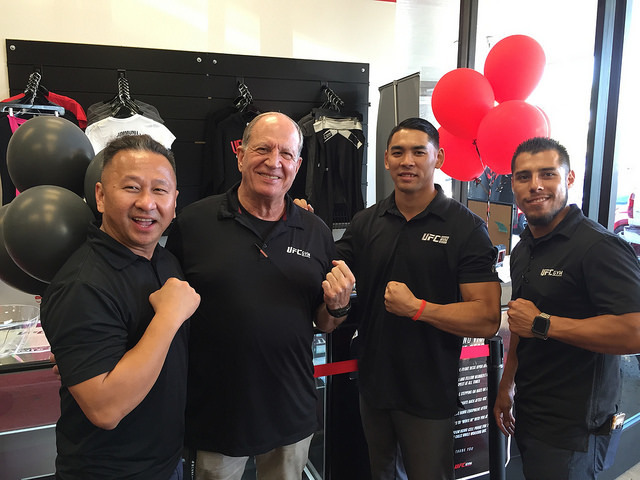 The Garden Grove UFC Gym is under new ownership and management and we celebrated their Grand Re-Opening with them. 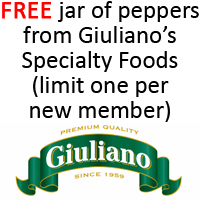 Come by and see what they are all about. We learned fitness is 20% exercise and 80% nutrition. We had a good crowd last night at our Chamber Monthly Mixer that took place right here at our Chamber office here on Main Street. Kaye's Kitchen provided us with yummy chicken wings that everyone enjoyed. Even Mayor Steve Jones, Council Member Thu-Ha Nguyen, and City Manager Scott Stiles dropped by. 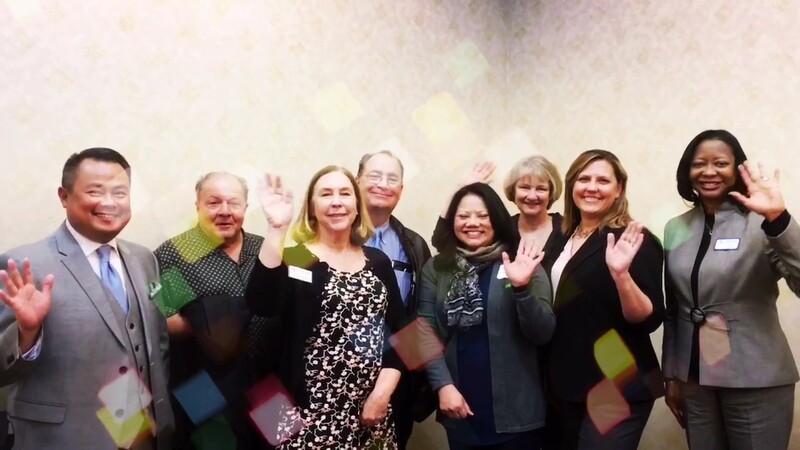 At our quarterly Business to Business Breakfast we had Chamber members from Ace High Casino Rentals, Dimond & Shannon Mortuary, and the Red Robin come give a presentation on what their business is all about. 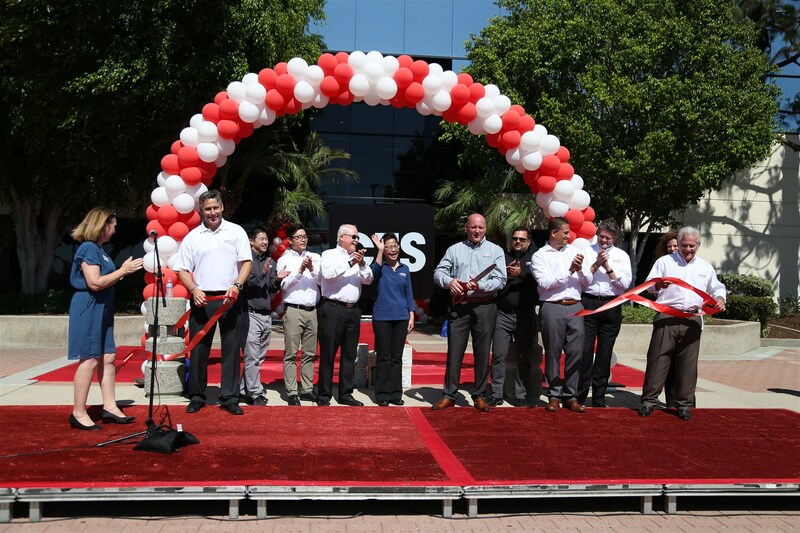 A crowd of over 200 attended CTS Cement's Ribbon Cutting Ceremony. They provided a couple of food trucks for the guests and a bouncy house for the kids. We also went on a tour of their facility and learned about the process of making cement. 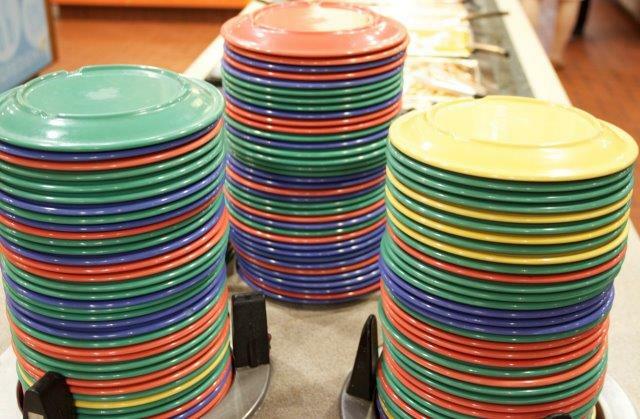 They are an employee owned company with a lot of happy employees. 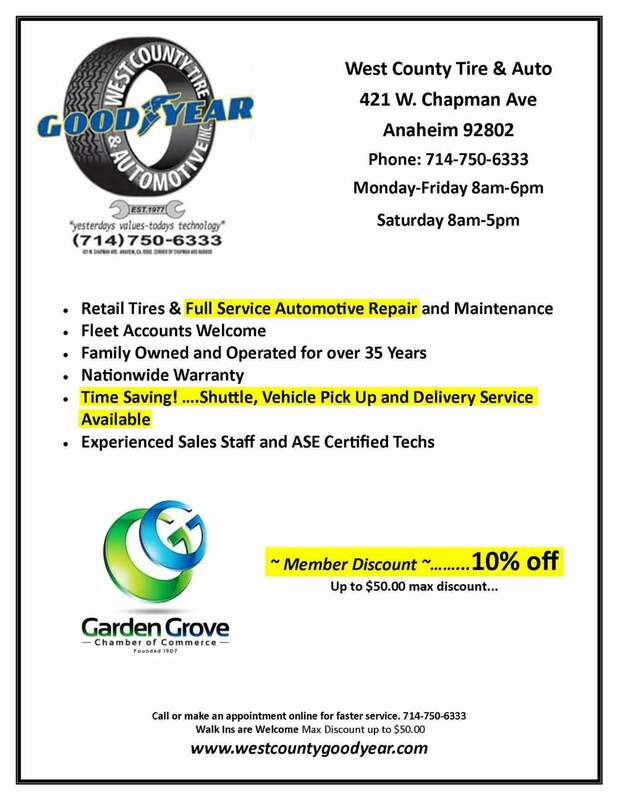 We are happy they moved to Garden Grove and will be a great business member. 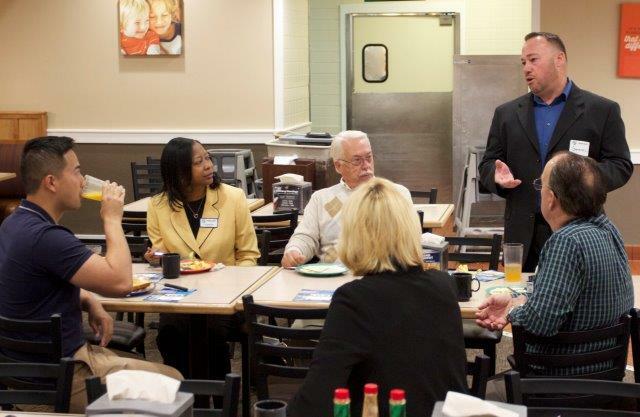 Creating an exit plan for your Business was the topic for the Chamber Business Breakfast this month. We had the pleasure of hearing from Mandy M. Woo, a financial planner. We had a special lunch for longtime Board of Director and Chamber Member, Joe Hammer, of California Relocation Services. 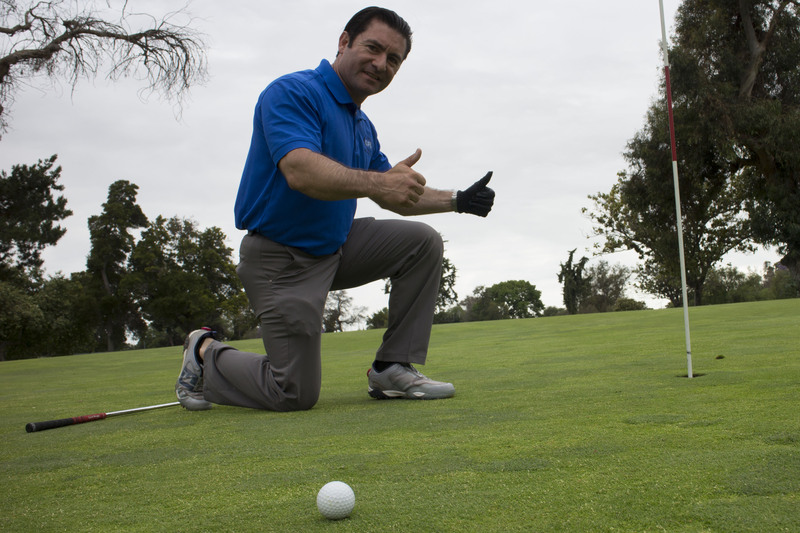 He served on the Garden Grove Chamber of Commerce Board of Directors since 1998. He served as Board Chair and was our CFO for several years. He plans on still going to our events, so be sure to meet him if you have not met him already. Ribbon cutting ceremony for OctaPharma Plasma was held Thursday , 06-21-2018. OctaPharma Plasma, opened up their doors to celebrate their grand ribbon cutting. They provided chamber members a tour of their OctaPharma Plasma Center. The Garden Grove Masons hosted the June Mixer at the Masonic Lodge in Garden Grove. 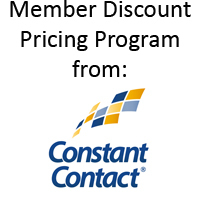 We are very proud to have them as a Chamber member and for all of the outreach work they do in our community. 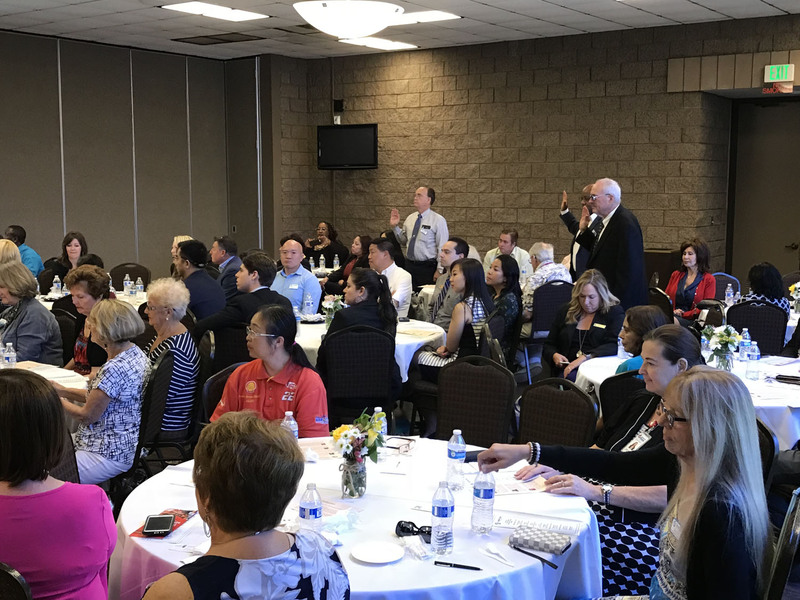 We held our Annual Leadership Luncheon at the Garden Grove Community Center to thank our membership, sponsors, and have our new 2018/2019 Board of Directors installed. Lunch was catered by Chamber member, Red Robin, with burgers and chicken sandwiches. Our own Fire Chief, Tom Schultz, lead us in the Pledge of Allegiance and we had the honor of Mayor Steve Jones install our Board of Directors and also our Women's Division Board of Directors. 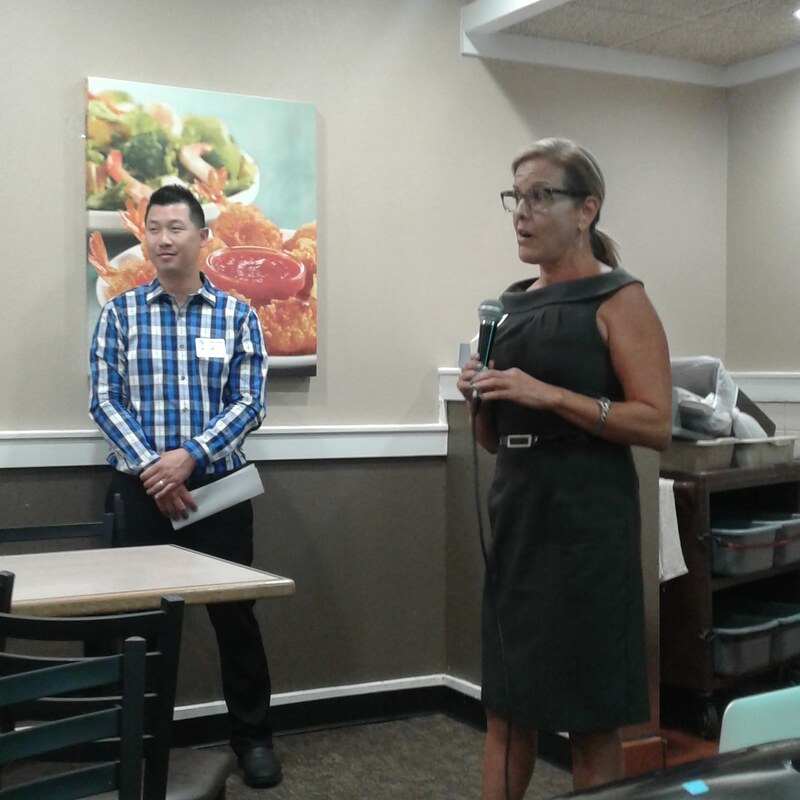 The Business Breakfast Meeting was at our new home, HomeTown Buffet and we had Usama Kahf of Fisher & Phillips, LLP speak on the new laws pertaining to hiring an independent contractor or hourly employee. 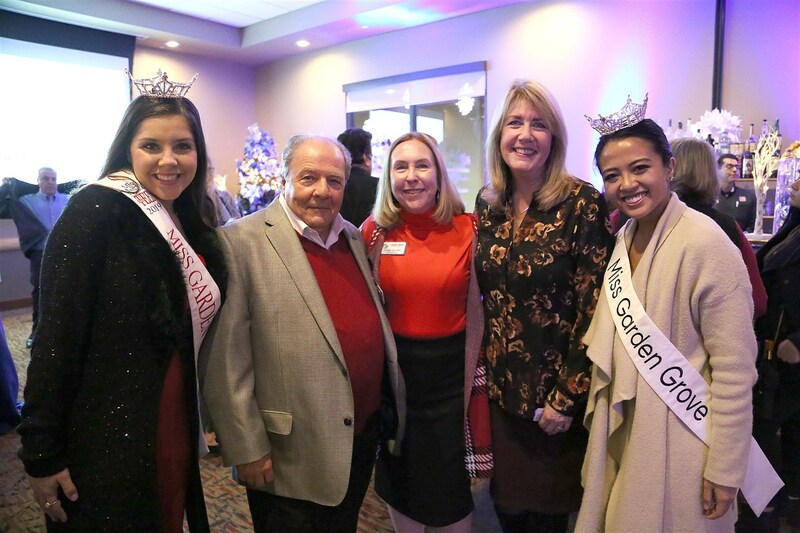 The Business to Business Breakfast Meeting was hosted by the Brookdale Garden Grove - Senior Living and Memory Care. The guest speakers were Pamela Junge of Brookdale Garden Grove, Lina Celella of The Elizabeth Do Team and Alyssa Allain of Walmart Store #4171 This morning we had the pleasure of hearing "The difference between Skilled Nursing and Assisted Living", "Real Estate News" and Walmart Free Grocery Pick UP"
A fun day of drinks, prizes, great food, and fabulous auction items to be had at this event. Ribbon cutting ceremony for Paris Baguette was held Monday, 5-07-2018. Craig Wells, Franchise Specialist from FranNet of Southern California gave a presentation on "Exploring Franchise Options" at our Business Breakfast. Many people through out the community attended the Silver Spoons Luncheon held at the Great Wolf Lodge. The Chamber was proud that three of our board members and our Women's Division President were honorees. 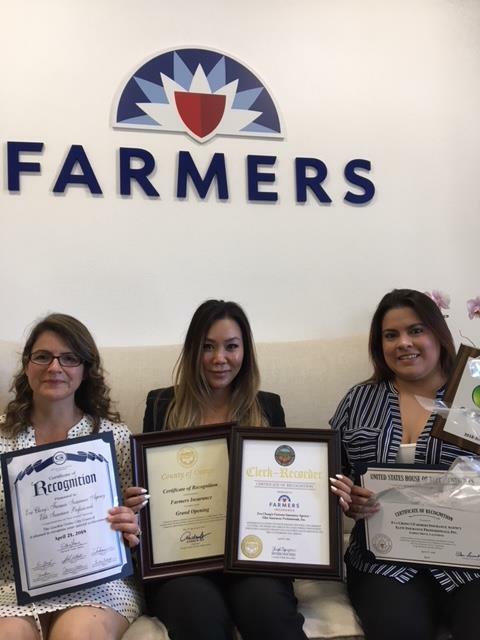 Ribbon cutting ceremony for Farmers Insurance Agency - Elite Insurance Professionals was held Saturday, 4-21-2018. Owner, Eva Chong, recently moved her business here from the Valley. Orangefield Child Development Center hosted the Monthly Chamber Mixer, The Executive Director, Sahilly Federico,talked about her preschool and how it's been growing since joining our chamber. On Wednesday, March 28, 2018, we held our very first Nonprofit Strategy Meeting! Thank you to everyone who attended, to ECofOC, to all of our speakers and to OneSource Distributors who provided the location! Destination: Garden Grove! That was the theme for our Annual Gala Dinner on March 24th. The Wyndham Anaheim Garden Grove (soon to be The Delta by Marriott) hosted our 112th Annual Gala Dinner. The food, decor, music, people and ambiance helped make this a great event. Thank you to everyone who helped with the event, attended and who make Garden Grove THE place to live, work, and play. Community Action Partnership of Orange County (CAPOC) hosted our March Mixer. CAPOC is a nonprofit dedicated to eliminating and preventing poverty. 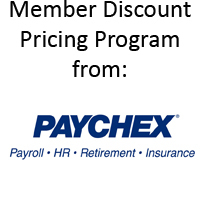 We are very proud to have them as a Chamber member and for all the work they do in our community. 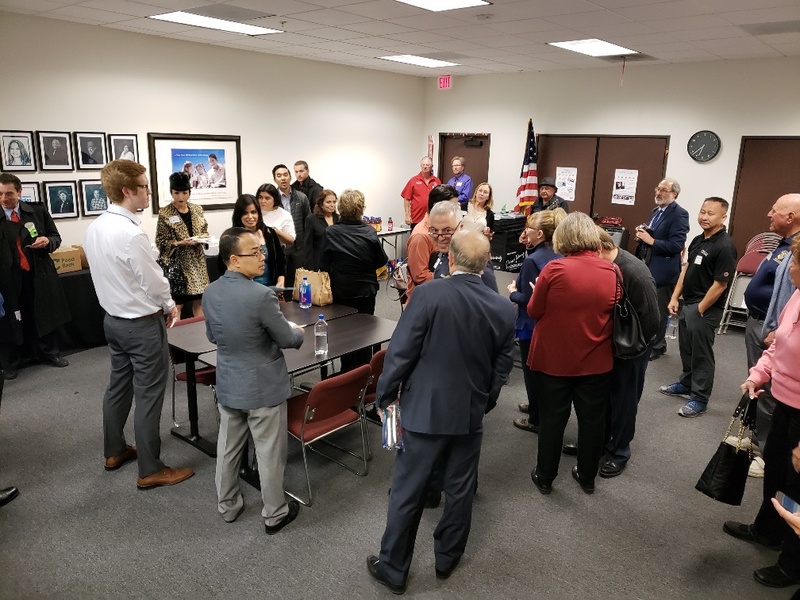 The Fountain Valley Chamber, Korean American Chamber and the Santa Ana Chamber joined us at our Government Affairs Committee Meeting on March 9th. Our guest speaker was Assembly Member, 72nd District, Travis Allen who will be a Republican Candidate for Governor for the State of California. ​The new SteelCraft in Garden Grove had their ground breaking ceremony today! Many of the new tenants opening restaurants were in attendance along with local City officials. SteelCraft originated in Long Beach and was the brainchild of it's founder, Kim Gros. Project should be completed in about 6-months. 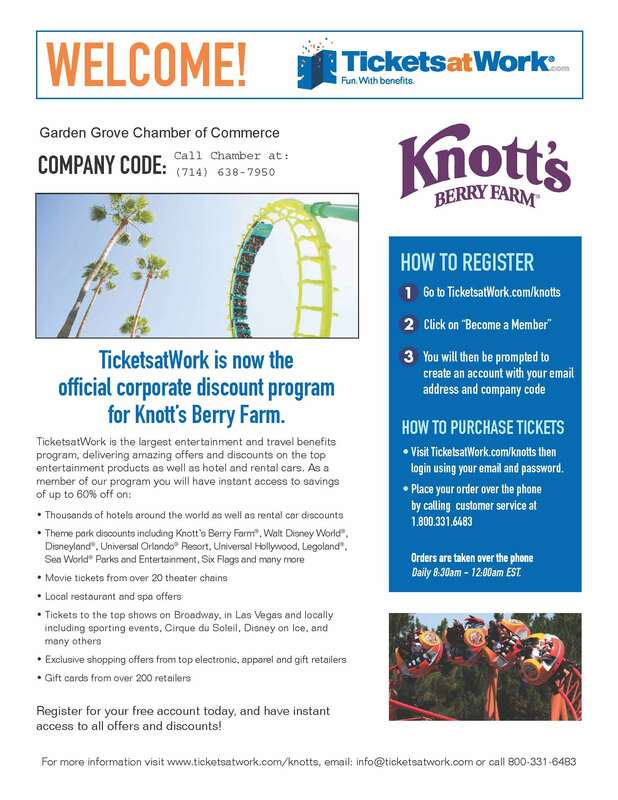 ​Another great collaboration between Chambers at our Multi-Chamber Mixer at Garden Grove's Great Wolf Lodge last night. 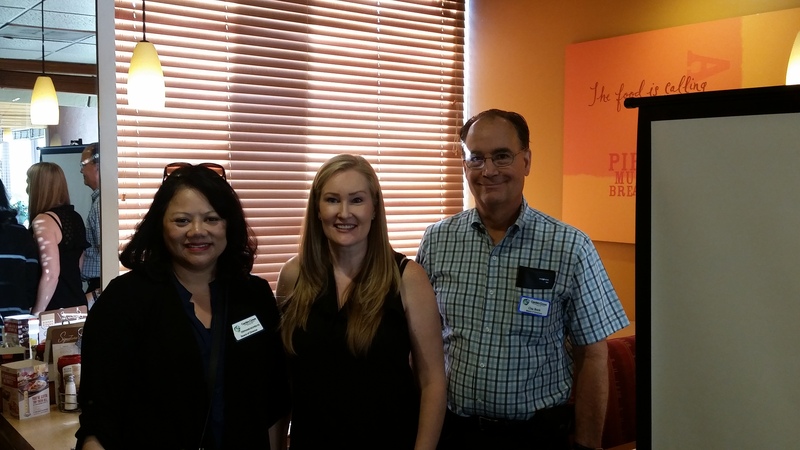 We had the Anaheim, Cypress, Fountain Valley, Westminster, and Garden Grove Chamber business members meet. Our host, the Great Wolf Lodge, always does a fantastic job. 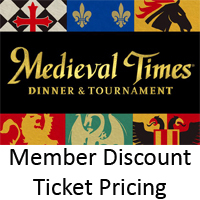 This type of event is a great benefit to our business members, whether they are a small or large business. Keep a look out for our next Multi-Chamber Mixer!!! Roni Ramos of Harmony 3 Productions gave a wonderful presentation on how to create your own short business video. We plan on having a workshop with Roni in the future to show more members how to create your own video. Credit Union of Southern California hosted a great mixer last night. We saw a lot of new people and enjoyed some delicious food! 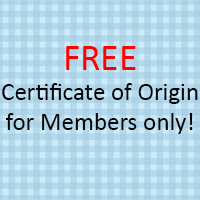 Did you know that you can bank at their credit union even though you are members of a different credit union? They are a co-op credit union. We celebrated Campbell Termite Control Services joining the Garden Grove Chamber with a Ribbon Cutting Ceremony. We are excited to have this new member right here on Main Street! It was wonderful to welcome The Elizabeth Do Team to Garden Grove. It is nice to have someone originally raised here moved their business back. 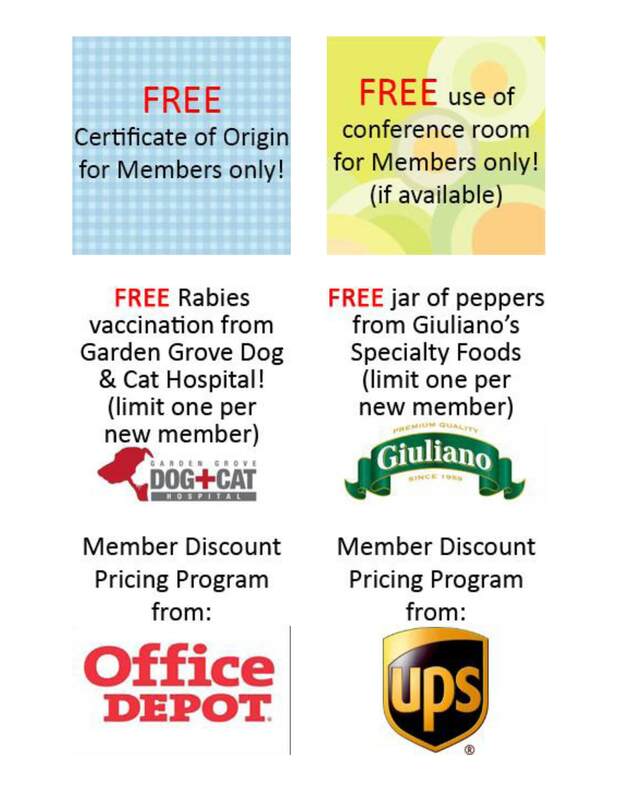 Another Chamber benefit is we give our business members the opportunity to showcase their business to other members. 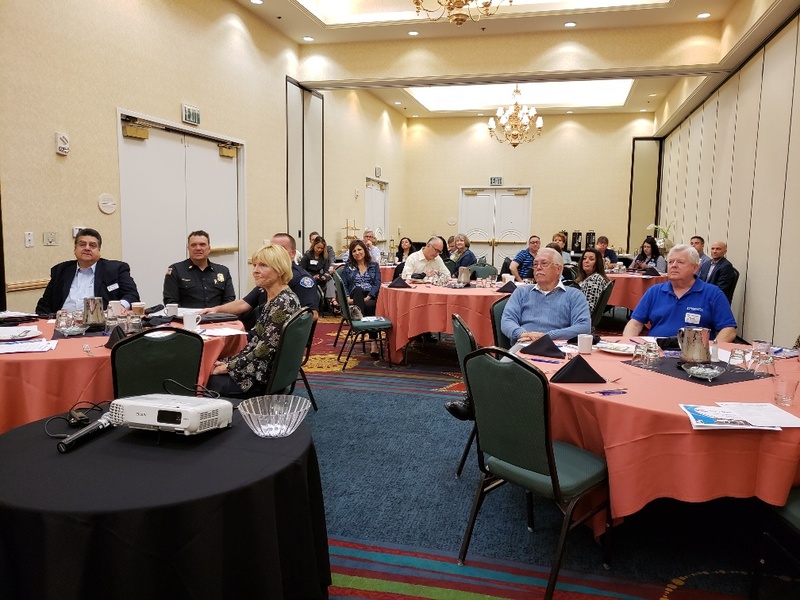 This morning we had the pleasure of hearing from Fred Giron of PHD Insurance, Steve Harding of American Family Housing, and Susie Clisson of West County Tire & Automotive! We had a packed house at our State of the City Luncheon on Wednesday, January 31st. Mayor Steve Jones spoke about how great Garden Grove is to work, live and play! We have an exciting year ahead of us. 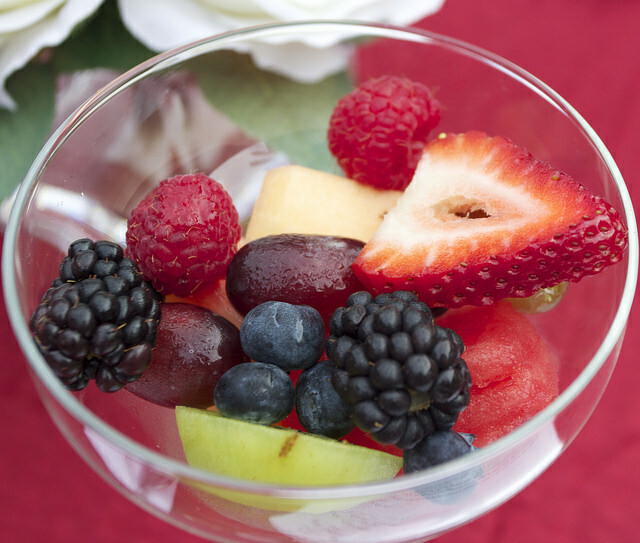 Our new Chamber member, On the Greens Catering & Conference Center, hosted our Chamber Mixer this month. This is on the Navy golf course and both the golf course and catering center are open to the general public. 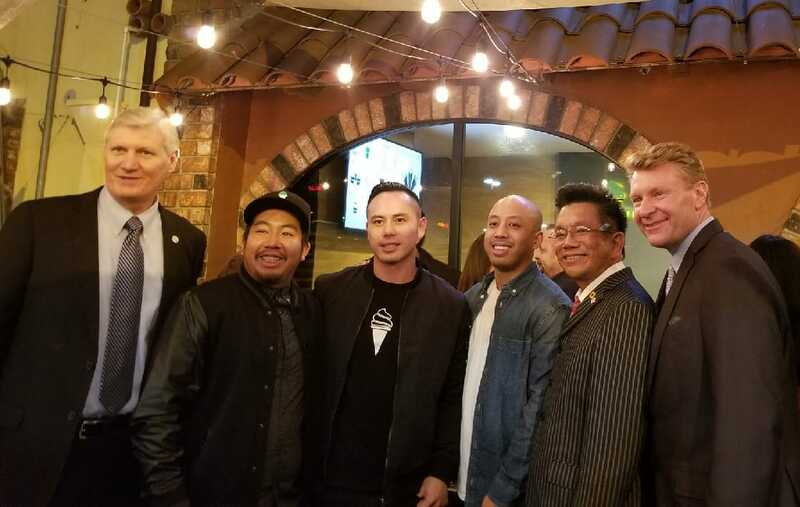 On Wednesday evening we celebrated Mr. Matcha coming to Main Street Garden Grove and joining the Chamber with a Ribbon Cutting Ceremony. We had a great turnout and enjoyed some samples of their delicious soft serve. 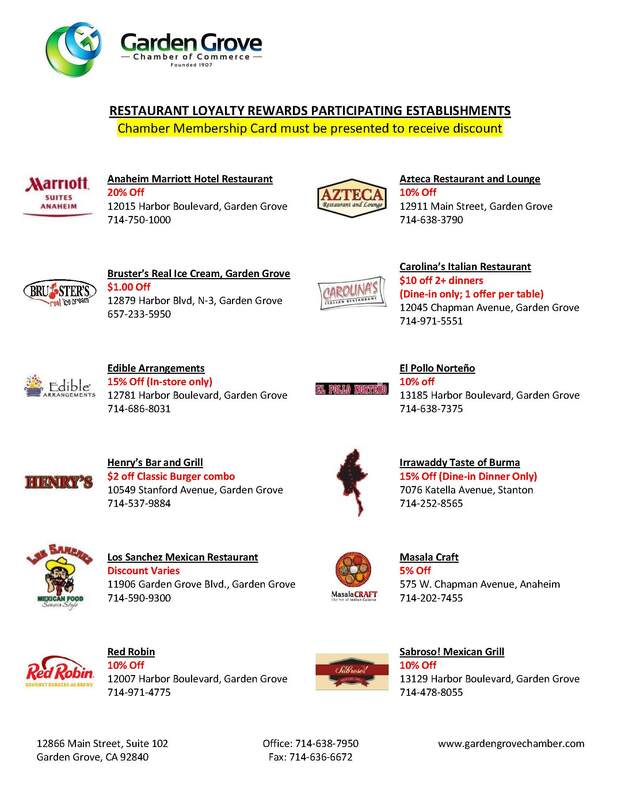 We had over 2,300 tickets in the drawing for our winners this year of Buy in Garden Grove. 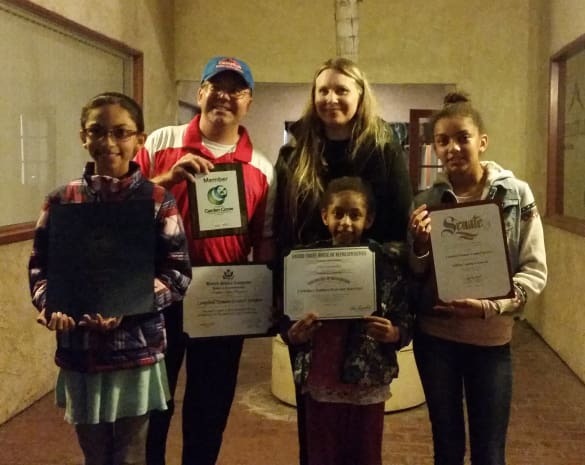 The Garden Grove Neighborhood Association won the $500 cash prize. The other two winners of a one-night stay at the Great Wolf Lodge, were Missy Mendoza and Meena Yoo. Congratulations and thank you for buying in Garden Grove! We welcomed Congressman Alan Lowenthal to Historic Main Street and the Garden Grove Chamber of Commerce with a Ribbon Cutting Ceremony. 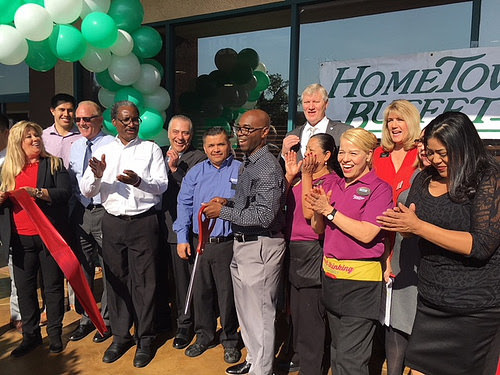 We celebrated the remodeling of HomeTown Buffet and welcomed them back to our Chamber with a Ribbon Cutting Ceremony! They really did a nice job and their staff is wonderful! 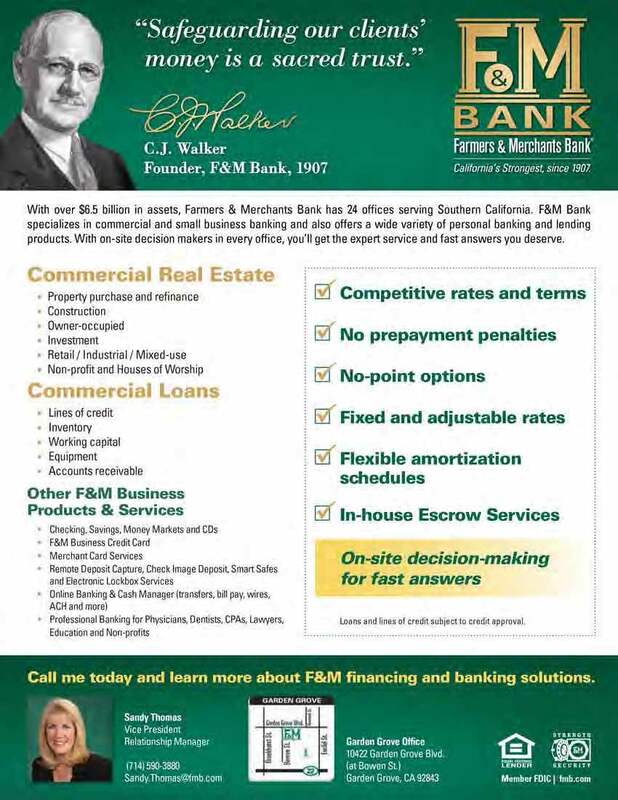 Farmers and Merchants Bank hosted our fabulous Holiday Mixer again this year. 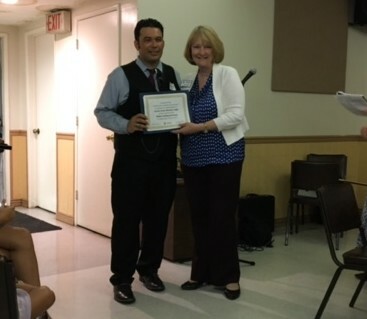 They have been a member with our Chamber for 62 years and we presented their President ,W. Henry Walker, and our local branch Vice President, Relationship Manager, Sandy Thomas, with an award thanking them for their support to our Chamber and the community of Garden Grove. for Kumon Math & Reading Center 12-08-17! We welcomed Kumon Math & Reading Center - West Garden Grove with a Grand Opening & Ribbon Cutting Ceremony. Monthly Chamber Mixer at Jay's Catering 11-15-17! Congratulations to Jay's Catering on having 50 years in business! Thank you for hosting our Mixer, it was a great event! We look forward to many more years of business. Business to Business Breakfast 11-09-17! Our new Business to Business Breakfast meeting is becoming a hit! Thanks to today's speakers for their wonderful presentations; Kelly Anvari of Visiting Angels, Clay Bock of Integrity Jewelers and Daniel Edwards of Edwards VoIP. Joint Chamber Mixer at Bowlmor Lanes 10-26-17! 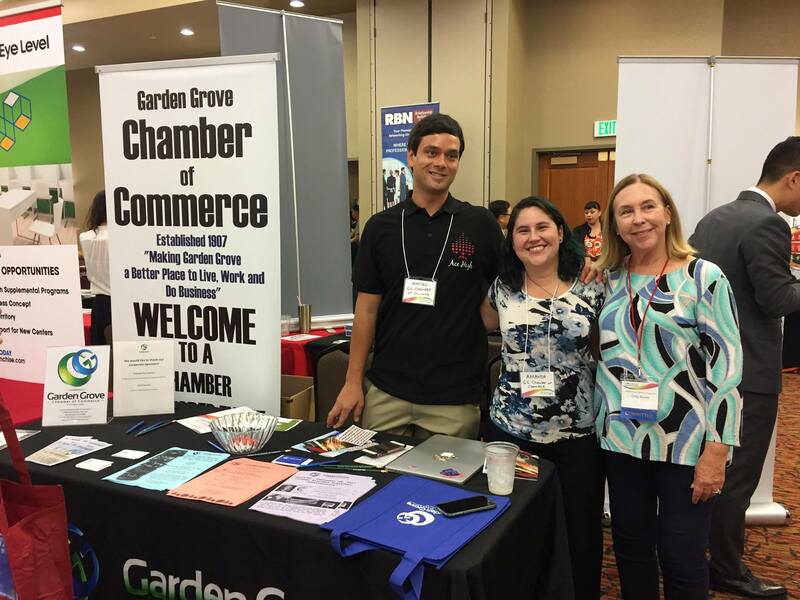 The Garden Grove Chamber of Commerce and the Anaheim Chamber of Commerce came together on Thursday for a joint chamber mixer. This successful networking event brought businesses from neighboring cities together for a fun night! Monthly Chamber Business Breakfast 10-26-17! Gwen Earle from the Better Business Bureau was our guest speaker for our Business Breakfast meeting this month. 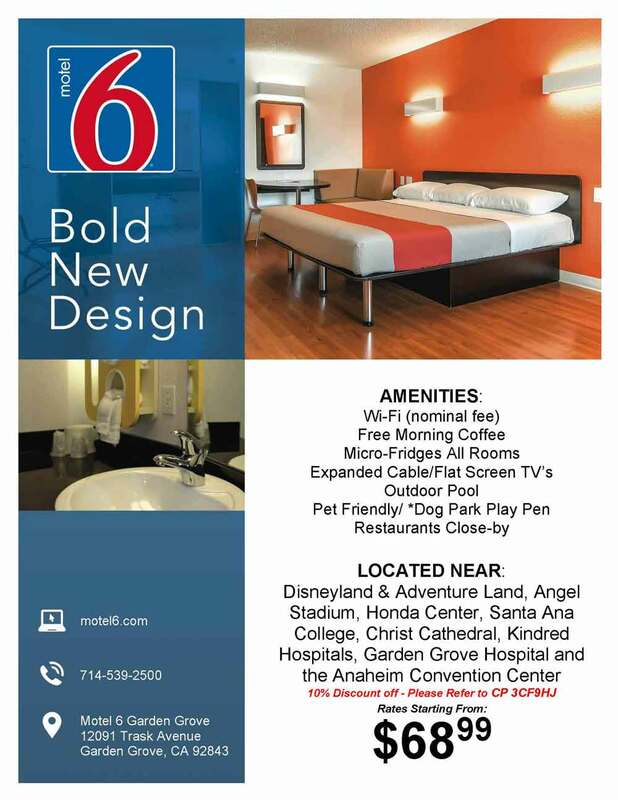 It was held at the Wyndham Anaheim Garden Grove Hotel! We had great attendance and wonderful food. Monthly Chamber Mixer at Anaheim Marriott Suites 10-18-17! Anaheim Marriott Suites hosted our October Mixer. Thank you to everyone who came and showed their support for this Chamber Member. There were over 70 attendees and great raffle prizes! Monthly Chamber Business Breakfast 9-28-17! Professor Tobi West from Coastline Community College was our speaker at our Business Breakfast today. She gave a very useful presentation on "Cybersecurity." Ace High Casino Rentals Ribbon Cutting/Mixer 9-20-17! We celebrated our New Member, Ace High Casino Rentals, Ribbon Cutting/Mixer on 9-20-17. 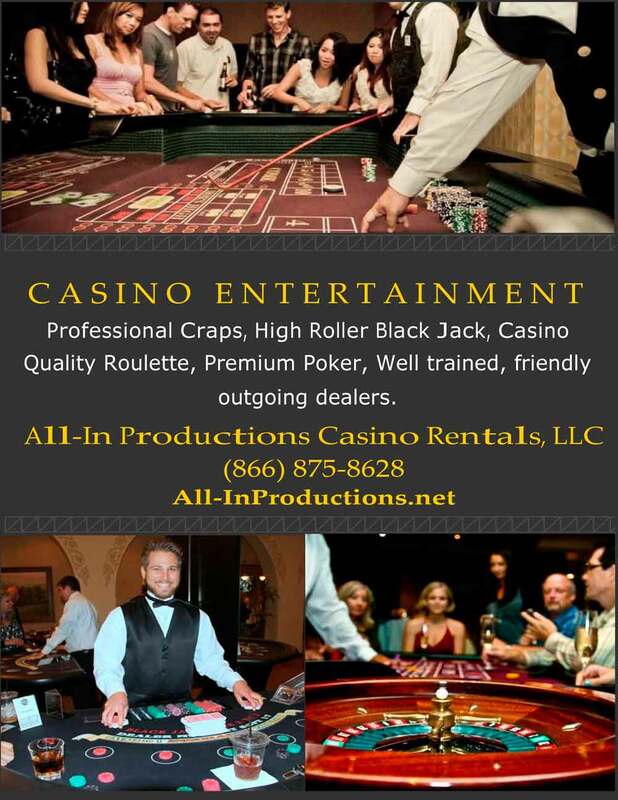 Everyone had a great time trying out their gaming tables of blackjack, roulette, and craps! 7th Orange County Asian Business Expo 9-12-17! We were at the 7th Orange County Asian Business Expo at the Great Wolf Lodge on Tuesday, September 12, 2017. 1st Place Team - Score: 1809 - Individual Team 4 "The Bowlers"
2nd Place Team - Score: 1575 - Garden Grove Police Department "Split Happens"
3rd Place Team - Score: 1416 - Farmers & Merchants Bank "Lend Us A Strike"
Ribbon Cutting Ceremony for All About the Bride & E Patisserie & Café 9-6-17! There were a lot of happy faces welcoming All About the Bride & E Patisserie & Café here on downtown Main Street celebrating their Ribbon Cutting Ceremony. Former owners of the building, Leo & Virginia Zlaket, were there supporting the new owners, Elizabeth & Tony Dang. Historic Main Street is back! Monthly Chamber Business Breakfast 8-31-17! This morning at our Business Breakfast meeting, Stephanie Nguyen-Yu of Nestegg Insurance Services gave a fantastic and informative presentation on tips on health care for your business. Chamber Mixer at Team AMVETS 8-17-17! Many of our members supported Team AMVETS at their mixer last night. Team AMVETS supports our homeless veterans by getting them into furnished homes. You can support them at their first time ever fundraiser, Vibes 4 Vets, taking place October 14, 2017 at The Festival Amphitheater in Garden Grove. Business to Business Breakfast Meeting 8-9-17! 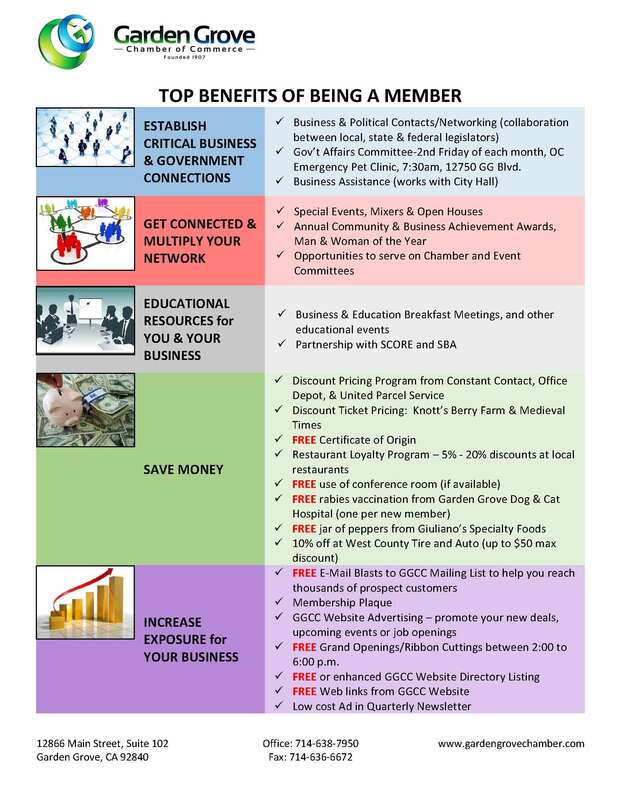 Our new Business to Business Breakfast Series is giving our members a chance to showcase their business. We had the pleasure to hear from three of our great members, Robert Emanuel of Debello Agency, Barbara Logue-Barish of the Leukemia & Lymphoma Society, and Jon Glant of Edward Jones. 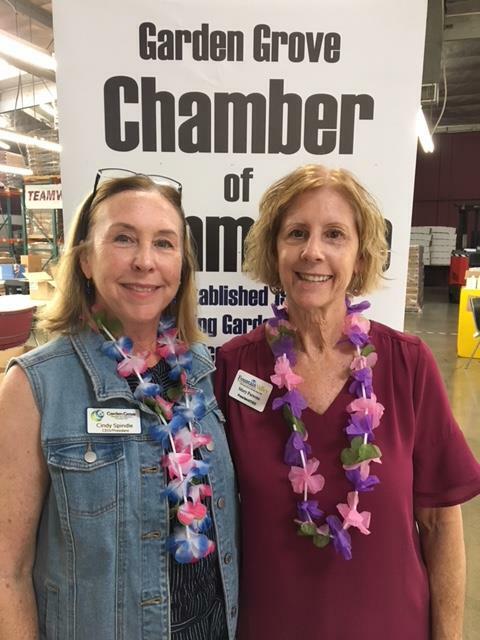 Chamber Mixer at Gibo/Kodama Chairs 7-19-17! Our Chamber Mixers are fun and sometimes full of surprises! Our mixer host Gibo/Kodama Chairs had a door prize giving away one of their office chairs. The lucky winner was Janet Leasure who is one of our Board of Directors. We welcomed our new member Orangefield Child Development Center & Learning Center with a Ribbon Cutting Ceremony. They provide preschool education, pick kids up after school and after school care. Monthly Chamber Business Breakfast 6-29-17! 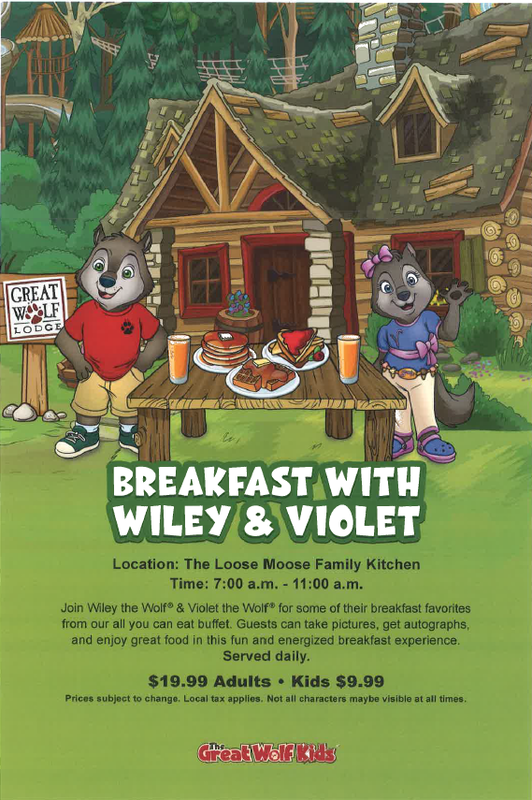 We had our business breakfast at the Wood Fired Grill, inside the Great Wolf Lodge, today. Bob Marsh from The File Depot gave a wonderful presentation on "Comprehensive Records Management Program." Mixer & Ribbon Cutting at the Garden Grove Masonic Lodge 6-21-17! 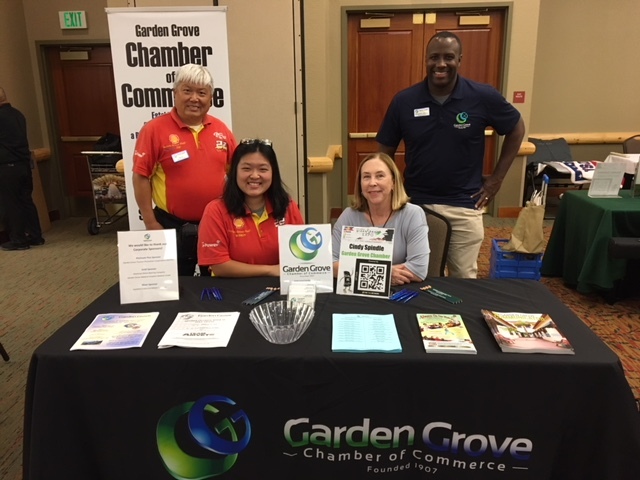 The Garden Grove Masonic Lodge hosted the Garden Grove Chamber Mixer last night and they were welcomed to the Chamber as one of their newest members. We want to thank them for all their service to the community and congratulate the Free Masons on their 300 year anniversary this year! Smart & Final Ribbon Cutting Ceremony 6-13-17! After 11 years, a new Smart & Final store opened up again here in Garden Grove. Many attended in support of their soft opening. 2nd Annual Leadership Appreciation Luncheon 6-8-17! We held our 2nd Annual Leadership Appreciation Luncheon on Thursday, June 8th. Our new 2017-2018 Board of Directors were installed by Chief Elgin along with the Women’s Division Board of Directors. 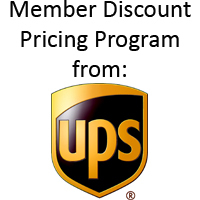 Our members and sponsors are greatly appreciated by us and make our Chamber stronger. Morningside Recovery Ribbon Cutting Ceremony 6-7-17! Congratulations go out to Morningside recovery at their Ribbon Cutting Ceremony on Wednesday, June 7th. They will be the second largest recovery center in Orange County with 87 beds. 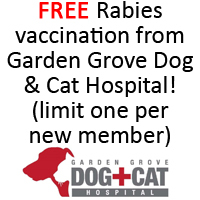 We are happy to have them in Garden Grove. Bruster's Real Ice Cream, Garden Grove 6-2-17! 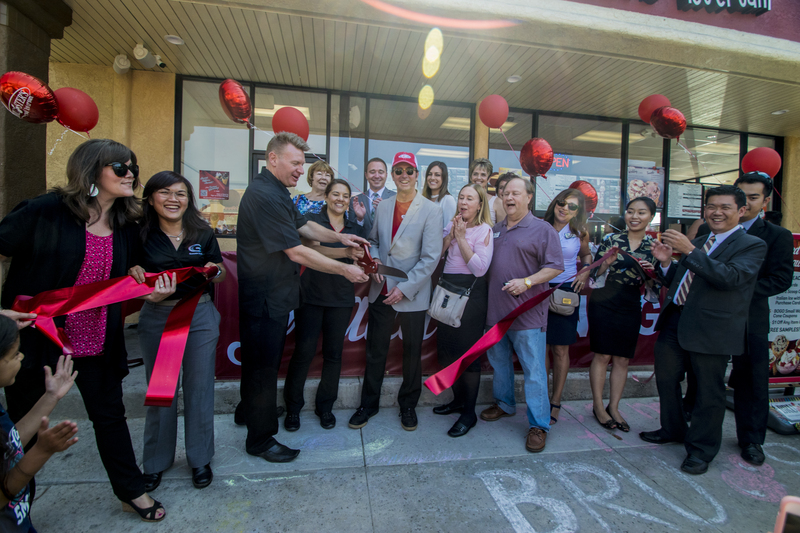 We welcomed Brusters Real Ice Cream, Garden Grove with a Ribbon Cutting Ceremony. All their ice cream is made right there fresh, please make sure you try some. If you bring a Banana on Thursdays you will receive a banana split at half price. 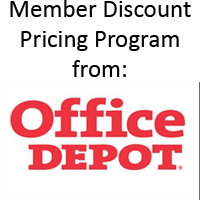 All chamber members get $1 off their total when they present their membership card. The Chamber of Commerce participated in the parade again this year. Many of our members and Board members walked in the parade. Our Chamber Board of Directors, Sandy Thomas, a.k.a. Garden Grove Woman of the Year was also in the parade along with Steve Sanders, Garden Grove Man of the Year. Phil Cunningham, General Manager of the Great Wolf Lodge Southern California, was our speaker at Thursday's Breakfast. Wolf Ear's were provided as well as delicious food and an interesting presentation on "Marketing and Branding." Thank you to everyone who attended and to the Great Wolf Lodge for hosting us. 13th Annual Golf Classic 5-10-17! 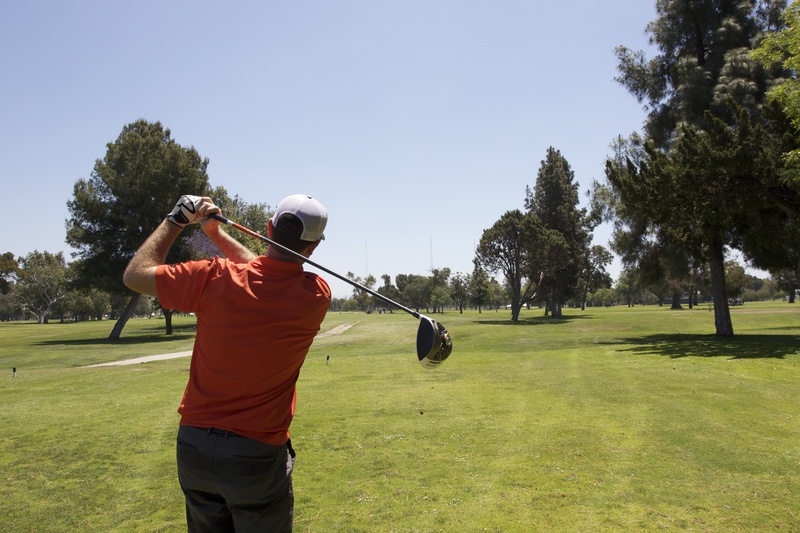 Everyone at our 13th Annual Golf Tournament enjoyed their day. There was fun prizes, great food, and fabulous auction items to be had at this event. Looking forward to another great event next year. The launch of our new "Business to Business Breakfast" meeting this morning had three of our members giving us helpful information relating to their business. We had Andrea Williams of Elwyn California talking about Hiring Individuals with Disabilities; Curtis Gibbs of Community Action Partnership of Orange County letting us know who they are and what they do for Orange County; and Van Nguyen Gordon of Van Nguyen Gordon Insurance and Financial Services talk about Retirement Planning. 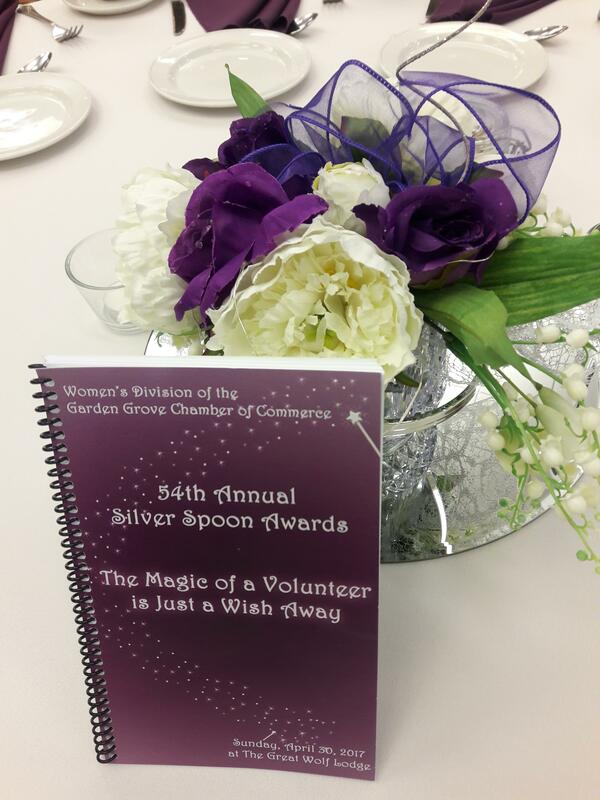 The Women's Division of the Garden Grove Chamber of Commerce held their Silver Spoons Luncheon yesterday at the Great Wolf Lodge! Great event honoring our many volunteers throughout the Garden Grove community! We learned about certification for female or minority businesses from our guest speaker, Leila Mozaffari of the SBDC at our Business Breakfast. 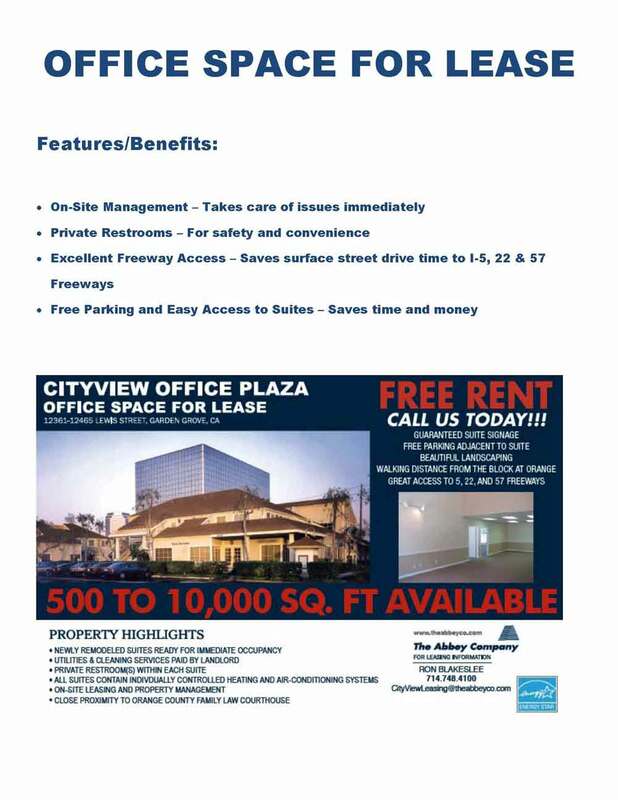 If you are looking for information about this, please call us and we will put you in touch with the SBDC. We held our monthly Chamber Mixer on Wednesday April 19th here at the Chamber Office. Many people came to this event to welcome our new members and network. Special thanks to Kaye's Kitchen, Doug's Downtown Grill and Azteca Restaurant and Lounge for donating food. 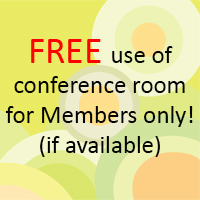 Monthly Membership Committee Meeting 4-11-17! Our membership committee held their monthly meeting at Irrawaddy and presented them with their new member basket. They also presented World Financial Group with theirs. 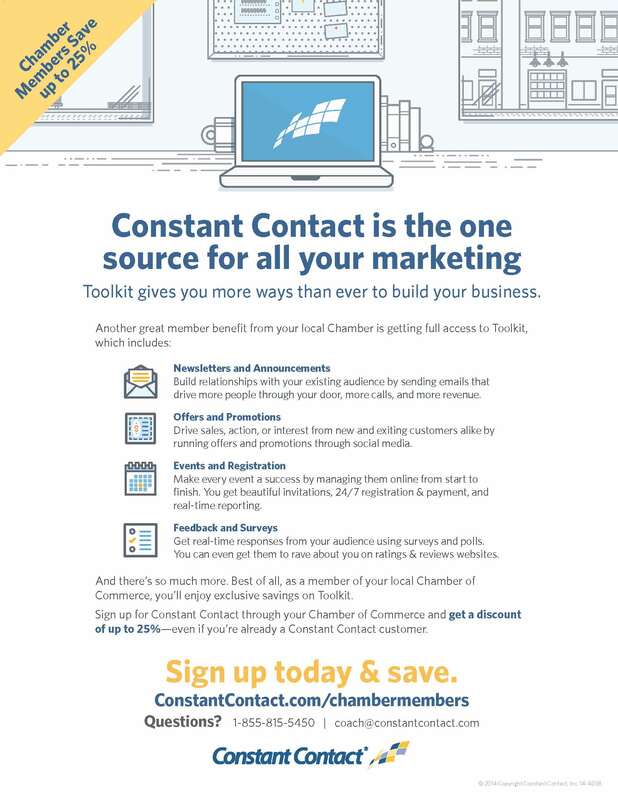 Thank you for joining the chamber and we look forward to working with everyone. Chamber Gala Dinner and Awards 3-25-17! 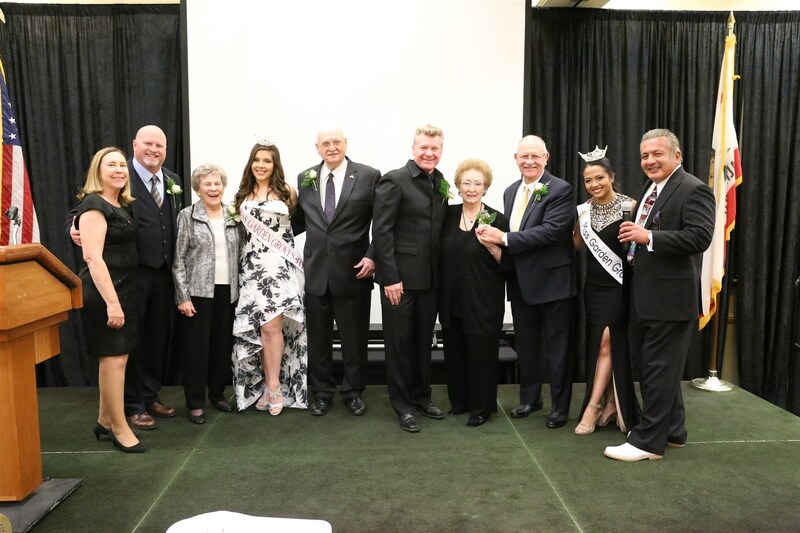 The Garden Grove Chamber of Commerce held it's 111th Annual Gala Dinner and Awards at the Great Wolf Lodge on Saturday, March 25, 2017. Harmony Partners Barbershop Quartet entertained us, Larry Schwartz provided a classic car for photo ops, and Dustin Lam was our awesome photographer. Everyone enjoyed the dinner then dancing. Chamber Mixer at Coco's Bakery Restaurant 3-15-17! 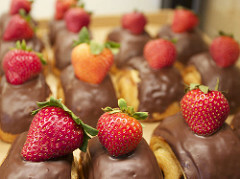 Coco's Bakery Restaurant in Garden Grove hosted our March mixer and provided delicious pies for us. We are very pleased that so many people came to support a Chamber Member and to make new connections. Mitch Seigel from Nine Dot Marketing gave an informative presentation on Understanding Cultural and Multi-Generational Differences. Thank you to everyone who attended. 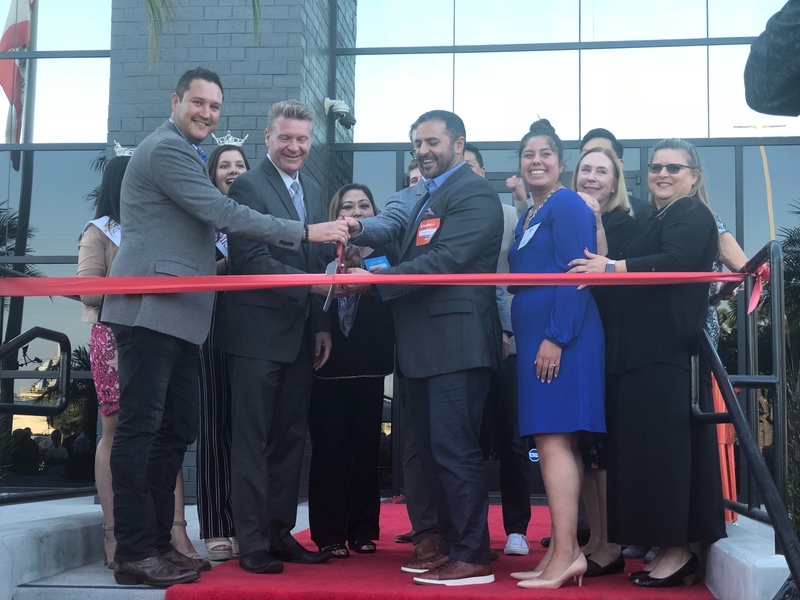 Orange County Workforce Innovation High School celebration their new facility and Chamber member with an Open House and Ribbon Cutting Ceremony on Thursday. Congratulations to the students who won various honor awards and to the faculty for all they do! 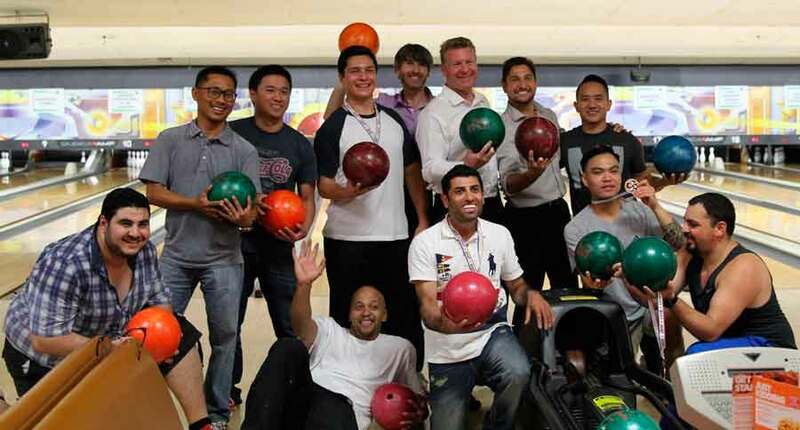 We had our Monthly Chamber Mixer at AMF Valley Views Lanes with the Cypress Chamber of Commerce. Many people attended this Multi-Chamber Event and we look forward to doing more things with Cypress in the future! Van Nguyen Gordon Insurance & Financial Services Agency celebrated their one year anniversary with a Ribbon Cutting Ceremony on Thursday, February 9, 2017. 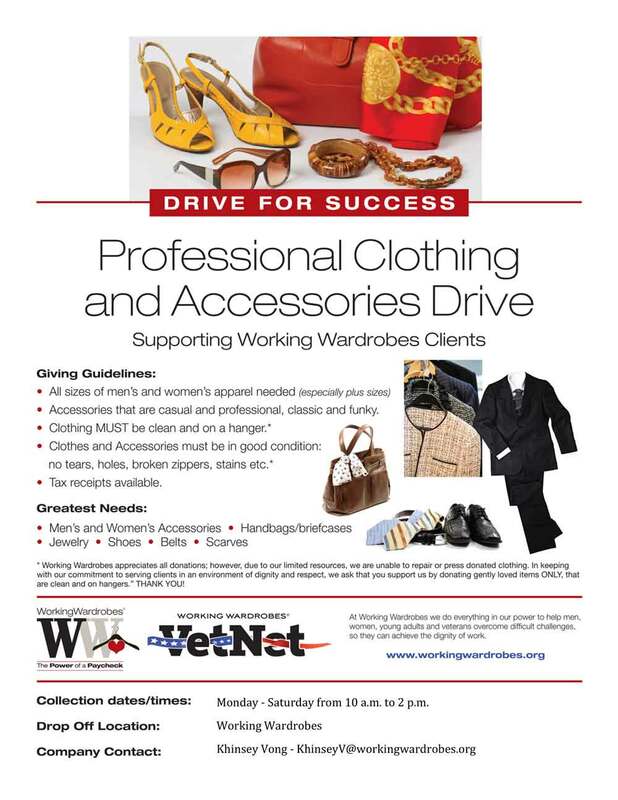 Thank you Van Nguyen for being a Chamber Member. 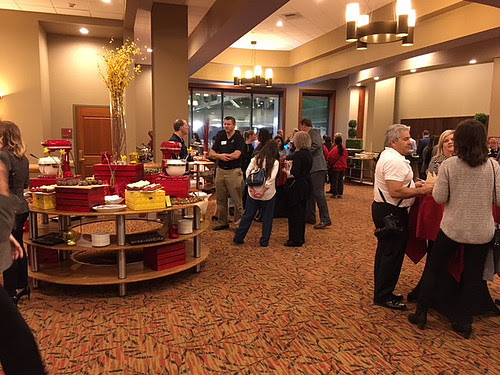 RBN (Relationship Building Network) held their Orange County's 2017 Kick off Major Business Expo at the Great Wolf Lodge of Southern California on Wednesday, February 8, 2017. 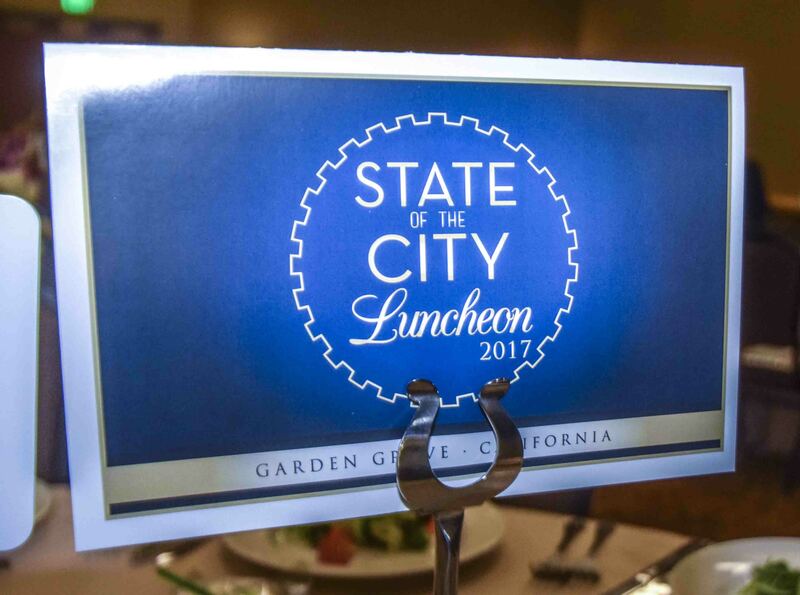 State of the City Luncheon 2-2-17! We truly are appreciative and want to thank of all our Sponsors of our State of the City Luncheon held at the Great Wolf Lodge on February 2, 2017. Your sponsorship helped make our event the success it was. We also want to thank our many members who attended. 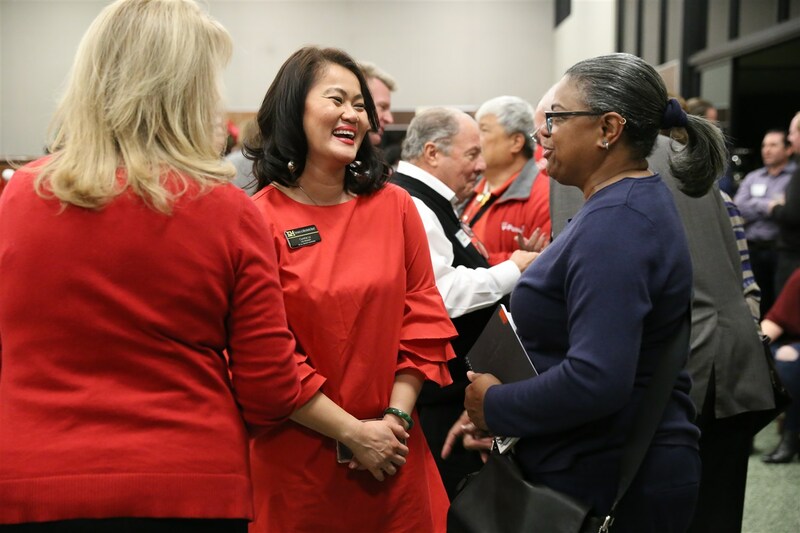 Your membership and support truly make our Chamber stronger so we can help our business community with networking events, legislative support, and educational programs. Tommy Lynch, UFC Gym Garden Grove, gave an informative and extremely helpful presentation on Workplace Violence. Thank you for the valuable information and to Coco'c Bakery Restaurant for the delicious food. Mixer at Integrity Jewelers 1-18-17! Integrity Jewelers hosted our January mixer. It was a dual celebration as it was also Clay Bock's birthday! Thank you Mary Ann and Clay Bock for hosting us and to Cliff Miller for the musical entertainment. Design A Smile Ribbon Cutting Ceremony 1-5-17! 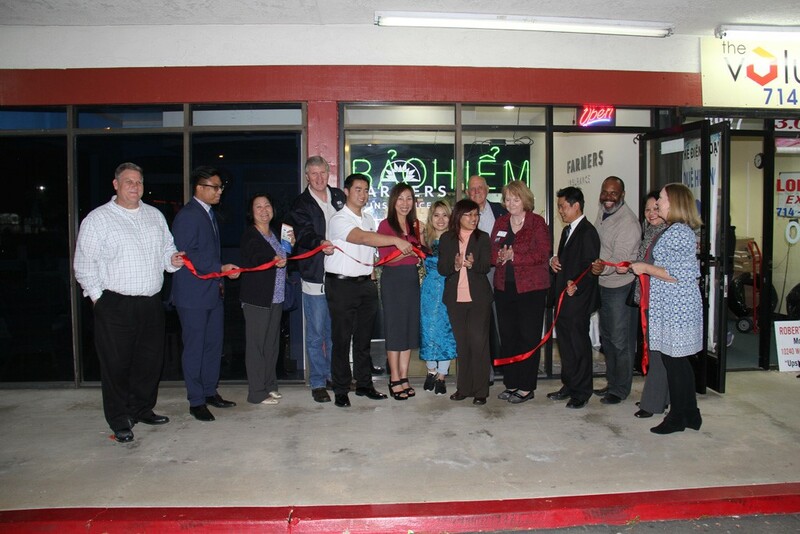 On Thursday, January 5th, we welcomed Design A Smile to the Garden Grove/Anaheim Area with a Ribbon Cutting Ceremony. Special thanks to El Farolito Jr for catering this event.